Now that going against the grain has become the norm, points out Baffler editor Thomas Frank, and nonconformity is sold in the form of Gap clothing, Nikes, and pickup trucks, "real" dissent -- by which he means dissent against consumer culture -- has become nearly impossible. While business takes full command of American cultural life, the many different varieties of dissent that once thrived in America have been abandoned in favor of a sort of pseudo-rebellion that one finds everywhere from poetry readings to Wired magazine to rainforest shampoo commercials. As Tom Frank points out in his 20-page rant, "Alternative To What?," there is a tragic and abject inability to recognize 'popular culture' anywhere "but in the officially-sanctioned showplaces of corporate America," and that citizens seem "utterly dependent on television to provide them with an imagery of rebellion." Against this pervasive commodification of dissent, The Baffler, a semiannual Chicago-based journal of cultural criticism "Blunts the Cutting Edge," and tackles the big questions of our time. If you enjoy a thorough debunking of the hip-seeking excesses of corporate culture, The Baffler is for you. 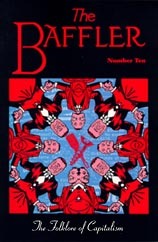 Samples issues are $7.50 from: The Baffler, P.O. Box 378293, Chicago, IL 60637. Subscriptions are $24 for four issues.